P&O’s Azura sails into Southampton, England for the first time. When we first wrote about Azura, P&O‘s newest addition to its fleet, back in April, we raved about the diversity of her public rooms and accommodation. Despite being built upon the same platform as Princess Cruises’ Crown Princess, Azura remained a truly distinct vessel that has been tailored in every way to appeal to British and European tastes. According to The Daily Echo, Azura also contains one small feature that has the capacity to be meaningful in an enormous way. For at least a decade now, passengers have been issued a plastic keycard upon embarkation. This serves not only as the electronic key to unlock their stateroom, but also as their charge card for any items they may wish to purchase while onboard, from drinks to shore excursions to items in the gift shop. Azura takes things one step further. While the keycard guests are issued with is still utilized for all of the above, they also perform one additional task: controlling the lighting in your stateroom. When the keycard is placed in a small slot on the wall on the inside of the stateroom, the lights turn on. Removing the keycard causes the lights to turn off. By doing this, P&O is able to ensure that when passengers leave their stateroom, the lights turn off behind them, reducing the electrical load to the ship in the process. Less electrical demand means less strain on the generators, which in turn consume less fuel. Less fuel burned means less emissions, not to mention the cost savings to P&O every time the ship bunkers, or takes on fuel. 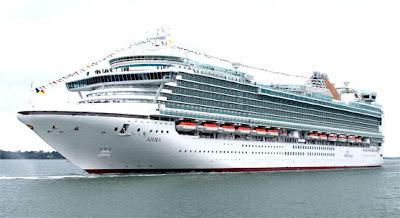 For more information on the unique and innovative Azura, be sure to visit the P&O website.